Optional you can download the latest version here and install the decompressed code in your projects directory under app/code/BitExpert/ForceCustomerLogin. After the installment of the module source code, the module has to be enabled by the Magento® 2 CLI. After enabling the module, the Magento® 2 system must be upgraded. If the system mode is set to production, run the compile command first. This is not necessary for the developer mode. To upgrade the system, the upgrade command must be run. At last, the Magento® 2 should be cleared by running the flush command. Sometimes, other cache systems or services must be restarted first, e.g. Apache Webserver and PHP FPM. Find the complete user guide here. The usage of the Force Login Module for Magento® 2 is applied implicitly by redirecting visitors if the called URI does not match any configured whitelisted url rules. Whitelisting is based upon the usage of rules. The strategy selection defines how the rules are interpreted, details are listed below. By default, some static rules are already listed. The following example shows, how to add a whitelist entry for the homepage (startpage). Navigate to the Overview Grid and use the Add Entry button. Enter Homepage into the text field beside from the Label label. Enter ^/?$ into the text field beside from the Url Rule label. Select All Stores from the selection field beside from the Store label. Use the Save button in the upper menu. After being redirected to the Overview Grid, the new entry should appear to the list and the systems homepage should be available for guest visitors. The Force Login Module for Magento® 2 allows you to enable or disable the module itself on the level of websites, stores and store views. If the module is disabled, the whitelist ruling and the redirection are not applied. If the module is enabled based upon the configuration, the whitelist rules are process, which themselves are also configurable for all enabled stores or just specific ones. After installing and enabling Force Login Module for Magento® 2 with the CLI, you must be able to navigate to Stores > Configuration > Force Login, where you are able to configure the availability of the module for each website, store and store view. In the administration configuration, you are also able to setup the URL the redirecting is targeting to if not whitelist rule is matching. 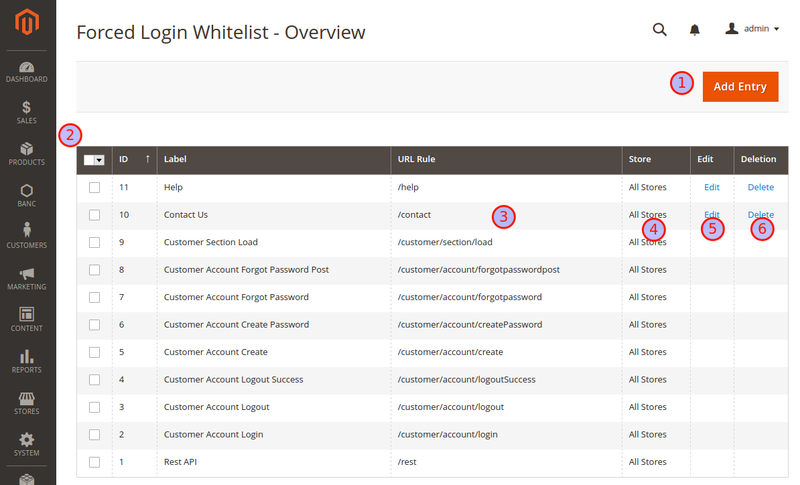 Navigating through the Magento® 2 backend menu by clicking onto Customers you must see a new menu entry Forced Login Whitelist. You can add new entries by clicking on the Add Entry button in the upper right corner ( 1 ), see below. The grid ( 2 ) contains all existing whitelisted Url Rules, for which the forced redirect to the Customer Login Page is omitted. The Url Rules ( 3 ) are part of a regular expression checking on the called Url and tries to match against the whitelist. Url Rules may be related to all stores or to a specific one ( 4 ). All rules except some mandatory ones are editable ( 5 ) and removeable ( 6 ). You can return to the Overview Grid by using the Back button ( 1 ). The Label value has only declarative character and is for information purpose only ( 2 ). The Url Rule is an expression checking on the called Url and tries to match against the whitelist ( 3 ). Url Rules may be related to all stores or to a specific one ( 4 ). The strategy selection ( 5 ) defines how the Url Rule is interpreted, details are listed below. Persist the rule by using the Save button ( 6 ). Rule is used as a literal value and will be added onto the base url for matching. This is default behaviour. Rule is based on regular expression, and will be used for looking up matching anywhere in the current Url. Based on the RegEx-All strategy, but negates the result. Helpful if only a few pages should be restricted. Feel free to contribute to this module by reporting issues or create some pull requests for improvements. The Force Login Module for Magento® 2 is released under the Apache 2.0 license.